Treasure Island or Debt Desert? Ever dreamed of owning a desert island? Hainan has issued new rules to promote the development of islands off its coast, but can developers overcome the problems of the past, which include high costs, natural disasters and the need to protect the local ecology? Owning a desert island might be a dream for many, but it is one that the lucky few in China might finally be able to realize, after authorities in the southern island province of Hainan recently issued new regulations on how individuals and private companies can develop islands, so long as they are uninhabited, not part of any current jurisdiction, and they are willing to take responsibility for them for up to 50 years. It is not the first time that China has tried to encourage development of desert islands by opening them to private investment – back in 2003, China issued a management regulation on the protection and utilisation of desert sea islands, allowing investment by individuals and private funds. At that time, China reportedly had more than 6,500 desert islands with an area of over 500 square meters, and those covering a smaller area were thought to number in the tens of thousands. Yet, despite the abundant resources, few were actually willing to stump up the cash. Chinese media reported that many islands under private development had subsequently been abandoned due to the exceptionally high cost of development or the negative impact on the local ecology. According to the sea island management director from Hainan’s Department of Ocean and Fisheries (DOF), who would only give his surname Chen, Hainan’s latest document on the private development of desert islands is not to encourage development, but merely a detailed rule to ensure the proper implementation of China’s Law on the Protection of Sea Islands and the Approval Rules on the Development and Utilisation of Desert Islands issued by the former State Oceanic Administration (SOA). He revealed that so far, they have not received any applications for private development of a desert island. According to Chen, Hainan’s latest document has, compared to the prior document which was nullified in 2017, simplified the application formalities. Now, it does not make a difference who has jurisdiction over the island – a county or a city – an applicant may directly submit their application to the provincial DOF who will make a field investigation based on the application materials before they submit them to the provincial government for final approval. To help applicants to better measure their development capability and undertake the preliminary planning which should be submitted with the application, Hainan put its islands into six categories based on their location and function, and defined the standard fee for island use based on the degree of development. For example, an applicant should pay 57,300 yuan (US$8,900) annually for the use of a 10,000-square-meter island in a prime location which will be developed into a tourism spot. If an applicant just plans to use a 10,000-square-meter island in a bottom-ranked location for agriculture or farming, they only need to pay 2,500 yuan (US$384) a year. It means that a potential developer must have a clear idea of the location, area, function and degree of development of the target island before submitting the application. But Hainan has not yet published a specific list of islands open to private development. Chen said that the list must be based on the general planning stated in the Law of the Protection of Sea Islands and that ecological protection is the top priority. This may explain why no one is biting at the opportunity. Few would have both the money and the ability to develop and maintain an uninhabited island while keeping the ecology intact. 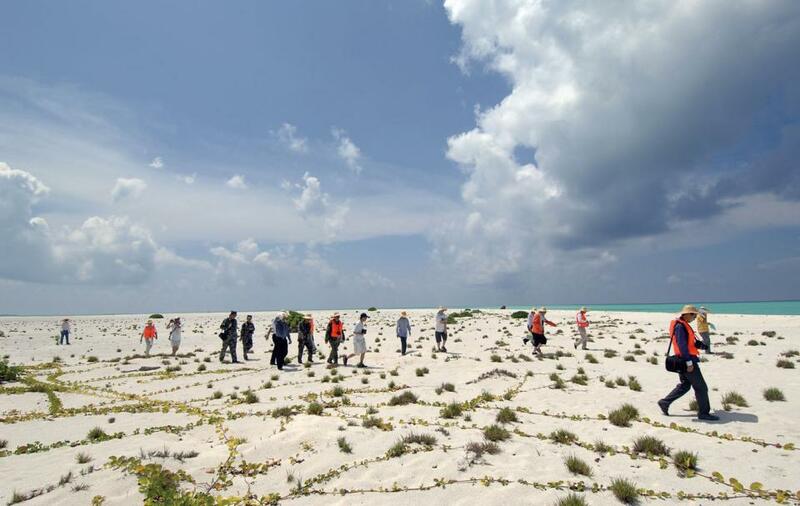 This has been proved by past experience – in April 2011, the SOA published China’s first list of 176 desert islands for private development in eight provinces and municipalities. Then SOA director Li Haiqing told media that they hoped to increase domestic consumption by opening these islands for private investment, but the expected rush to develop fizzled out. destination for yachting. Construction ground to a halt in the early stages in 2014, but not before Gaobao had sunk 500 million yuan (US$76.9m) into the project. Gaobao told local media that unpredictable tides on the island and summer typhoons often forced them to stop work, and that the cost of generators and transportation of construction materials was three to five times that of land-based construction. It was beyond their financial capacity. Even when development has finished, it is hard to gain returns quickly. In 2004, local businesswoman Chen Xiaoxian contracted to develop Zhuyu Island in Wenzhou, Zhejiang Province, spending five years and over three million yuan (US$0.5m) to make it into a scenic spot, only to find that the growing number of tourists threatened the local ecology. The scenic spot was finally closed, and Chen, after receiving one million yuan (US$153,846) compensation from the local government, refused to continue with the second phase of development. Operations on the island have ceased. island whose right of use was clearly granted by the local government to Longgang, another local investment company, Danmenshan was slated to become a one-billion-yuan (US$153.8m) tourism resort with golf courses and high-end restaurants by 2020. The project, however, ground to a halt in 2015 due to poor returns from phase 1. Local oceanic authorities said that up until 2017, the company was still involved in a new scheme to improve operations on the island. According to Zhou Shifeng, director of the Zhejiang Development and Planning Institute, a major reason behind the failures lies in developers significantly underestimating what it takes to develop an island. “Many islands suffer natural disasters like typhoons which badly impact the construction, and it needs huge amounts of capital to build infrastructure and facilities, but there are no short-term returns,” he told magazine Oriental Outlook in 2009. “I have spent every penny in my pocket on the island and I also set up a foundation to [financially] support its future upkeep... Don’t even think of earning money if you intend to develop a desert island,” he added. Lianhua is open to tourists free of charge, and is praised as a model for privately developed islands. However, Zhu said that Lianhua’s experience could not be duplicated, since few investors would be as professional as him in ecological protection or would be willing to put so much into it. “People who are ignorant of ecology will earn no money from developing a desert island, they’ll just end up destroying the local ecology,” Zhu warned. Chen Pingping, deputy director of the Oceanic Economy Institute under the National Institute for South China Sea Studies, told NewsChina that she holds a conservative attitude toward the private development of desert islands. “We have seen a lot of unreasonable planning, shortage of infrastructure and under-estimation of the capital needed to develop them. Worse, lack of awareness about ecological protection as well as a lack of professionals in island development will result in irreversible damage to an island and its surrounding marine ecology,” she told NewsChina. Truth be told, the “irreversible impact” Chen Pingping mentioned has already taken place. According to data from the SOA, 806 desert islands have already disappeared from China’s marine waters, over 700 of which were reclaimed, 66 were destroyed for stone mining and the remaining 30 disappeared naturally. Zhou Shifeng revealed that his survey in 2009 found that the number of desert islands in Zhejiang Province has continually declined, already several hundred less than in 1990. Zhejiang’s Zhoushan, China’s only archipelago city, has 1,390 islands, and earned around 40 billion yuan (US$6.2m) from its marine economy by 2007, according to Oriental Outlook, but most of its 100 developed islands were “coarsely developed” and “purely for commercial utilisation,” insiders said. In 2008, Zhoushan reclassified its local uninhabited islands, concluding that only 300 more were suitable for development, with the rest all defined as those that need protection and preservation. Hainan was subject to a similar problem, and has been often criticized by media for blindly developing marine resources. In early 2018, the Hainan government was warned by the central supervision team of the former Ministry of Environmental Protection (MEP) that some local coastal cities and counties have destroyed the marine ecology by illegally reclaiming land for real estate projects. For example, Phoenix Island in Sanya, the southernmost city in Hainan, should have been used as an international port as planned, while its developer actually used it to build hotels on, which has severely eroded the western coastline of Sanya Bay and aggravated pollution in the Sanya River. Many experts have attributed such blind and even illegal development to poor management by authorities, pointing out that the laws related to desert islands lag far behind the development and that overlapping functions of different ministries have obstructed smooth and efficient management. During this March’s structural reform of the State Council, the Chinese government combined the SOA, the Ministry of Land Resources and the State Bureau of Surveying and Mapping into the new Ministry of Natural Resources and renamed the former MEP to the Ministry of Ecology and Environment. It was believed to be a major move to streamline the management of natural resources and to further emphasize ecological and environmental protection. That is why Director Chen emphasized during the interview with NewsChina that ecological protection is the top priority in the private development of desert islands and that they require every applicant to include how they intend to protect and supervise the local ecology into their preliminary development planning. It actually sets up a “hidden barrier” for potential applicants, according to Zhu. Yet, both he and Chen Pingping found it was good for the long-term benefit of islands. “[Compared to the economic returns], I’d rather see island development draw more people’s attention to protecting marine ecology and spreading marine culture,” Zhu said. Chen Pingping added that she believes Hainan’s abundant natural resources, pleasing climate and its advantages brought by trade free zones and ports will finally attract properly qualified developers, as long as the authorities abide by the rules they have set out in their latest document.